This renovated apartment is located in a preserved Bauhaus building built in the 1930s in Tel-Aviv. The apartment is located in the heart of Tel-Aviv, overlooking one of the most beautiful boulevards in the city next to Israel's national theater "Habima". While acknowledging the importance of honoring and preserving the 1930s Bauhaus architecture, we wanted to keep this classic-European heritage also in the interior even though the apartment's style is contemporary. 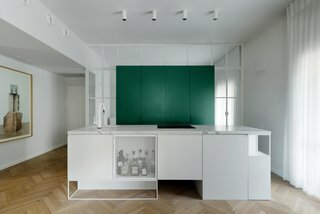 This was achieved by using materials such as: Carrera marble stone, safety-wired glass, steel, herring bone styled wooden oak floor, exposing a wall built out of original silicate blocks, and using a monochrome color palate, using stone-white, gray and black colors with splashes of green, blue and copper. but when we entered the apartment it was still dark and gloomy with a sense of heaviness and closeness, with no connection to the outside balcony or the view, although it has 4 sliding exit doors to the balcony. The apartment had no chic nor character. We then decided to create a big open rectangle shaped space, parallel to the Bauhaus balcony measuring 11 meters long and 4.2 meters wide. We also managed to keep the apartment's ceiling at its original height, 3 meters. Now sunlight washes the whole apartment through those 4 balcony exits. Furthermore, we decided to create a clean and airy space that contains a series of freestanding elements so they do not hurt its' wholeness; a big green cube for kitchen storage, a two-way kitchen island, a dining area and a living area. Walking paths were then created naturally between these "islands" leading to the balcony exits, or directly to the bedrooms or bathrooms. This led us to implement the conceptual notion of "islands" throughout the apartment. The main element in the public space is a big green cube used for kitchen storage, containing two refrigerators inside, a water bar, a coffee machine as well as dishes and food supply. The cube was then "wrapped around" by a glass vitrine divided by stone-white colored Belgium profiles with two entries one on each side of the cube leading to a family-room. The use of a glass vitrine divided by Belgium profiles not only allows natural light through but also preserves a European feeling reminding us the building's style. Next to the cube from the opposite side, facing the living room area, was costumed designed a two-way partly floating kitchen island being the main part of the kitchen containing a stove, an oven, a dishwasher and a cooking/baking area. Next to the island we placed the dining room table then we placed the living room, where the Husk sofa by B&B Italia is facing the view, the slow chair by Vitra placed next to her and a Doshi Levian carpet completes the look. The entrance to the master bedroom is from the public area, through safety-wired glass doors divided by stone-white colored Belgium profiles again, maintaining the 1930's architecture heritage. In the master bedroom, instead of walls we costumed designed a modular carpentry unit, used as storage and a sitting bench with a mirror welcoming those who enter the apartment from one side and on its other side used as a clothing closet. En-suit classic-European style bathroom sectioned off with a curtain for privacy. The kids' room, designed to accommodate 2 small children, a boy and girl, using also as a sheltered room in times of need, was built from concrete walls. The room measures only 10 sq., being as such we decided to obtain an open and roomy space for all activities. Therefore, we placed the children's toys in the family room, and we costumed designed a closet that has a built-in diaper-changing area in the middle. Opposite the closet we created the sleeping area, deifying it with a costume made bed built for two, with storage beneath. Lital Ophir I Interior Design uploaded Colorfull in the white city through Add A Home. kitchen- green cube storage containing two refrigerators inside, a water bar, a coffee machine as well as dishes and food supply. kid's room- designed to accommodate 2 small children, a boy and girl. a costume made bed built for two, with storage beneath. kid's room- we placed the children's toys in the family room, and we costumed designed a closet that has a built-in diaper-changing area in the middle. entrance to the master bedroom through safety-wired glass doors divided by stone-white colored Belgium profiles , maintaining the 1930's architecture heritage of the building. Master bed room overlooking en-suit classic-European style bathroom sectioned off with a curtain for privacy.